Wor. Richthofen Carrasco, Master of Huelen Lodge; R. W. Daniel Cerda, DDGM, Chile District; and R. W. Juan Brown, Grand Deputy Santiago. Having received its charter from the Grand Lodge of Massachusetts on March 14, 1877, Huelen Lodge in Santiago, Chile, celebrated its 130th Anniversary this spring. And this small lodge has much to celebrate. Some 30% of its members have joined in the past three years. The lodge held an anniversary dinner-dance in March and then celebrated with a special communication in April, followed by a formal dinner for lodge brethren and their Masonic guests. The celebratory program began and concluded with music—a violin solo by one of the lodge’s new members and a Masonic hymn written by Bro. Wolfgang A. Mozart. The lodge history was also presented. The lodge was pleased to receive Most Wor. 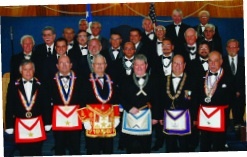 Juan Oyarzún, Grand Master, and other officers and members of the Gran Logía de Chile. Our District Deputy Grand Master for the Chile District, Rt. Wor. Daniel Cerda, presented a Certificate of Commendation, issued by Most Wor. Jeffrey B. Hodgdon, to the Grand Master of Chile. This page was last modified on 5 June 2018, at 14:37.